Boko Haram has been technically defeated, declared the Nigerian president Mohammadou Buhari in 2015 and again more recently. Nonetheless, there has been a series of violent attacks at the hands of this terrorist group, including the invasion and brief occupation of Bosso in Niger in 2016 and the recent second wave of girls’ abduction in Nigeria, which met no military resistance. The group struck in Tchoukou Island in earlier this year and conducted a deadly incursion in Cameroon a few weeks ago. Boko Haram, in fact, remains an important source of insecurity and instability in the Lake Chad Basin. It’s far from defeated. Starting as a social and political movement in 2002, Boko Haram shifted to become a violent terrorist organization after the murder of more than 900 members, including its former leader Mohamed Yussuf. Nigerian security forces had trouble containing this terrorist group, so Boko Haram started spreading its activities in the Lake Chad Basin and beyond. The sub-regional military intervention that began in 2015 by Benin and states directly affected by Boko Haram atrocities—Nigeria, Niger, Chad and Cameroon—has helped to reduce the group capacities and to weaken it. But faced with the continuing activities of this terrorist group, the sub-regional states will have to answer three major challenges. They must reinforce and better coordinate the collective military campaign against Boko Haram, address the socio-economic sources of support for this terrorist group, and solve the difficult question of de-radicalization and reintegration of former Boko Haram members. The military cooperation between Chad, Cameroon, Niger, Nigeria and Benin has marked the beginning of a new dynamic of security cooperation between states of the Lake Chad Basin plus Benin. This sub regional intervention neutralized many Boko Haram fighters, destroyed the majority of their camps, and exerted control over at least 80% of territory formerly occupied by Boko Haram. However, there is a persistence of mutual suspicion between members of the coalition due to their past border conflicts, such as the conflict between Cameroon and Nigeria around the Bakassi Island and the conflict between Chad and Nigeria over Islands in Lake Chad. This mutual suspicion has hindered the capacity of military forces to better coordinate their actions. A consequence is the lack of a single chain of command, which makes it impossible to fully implement and deploy the force. 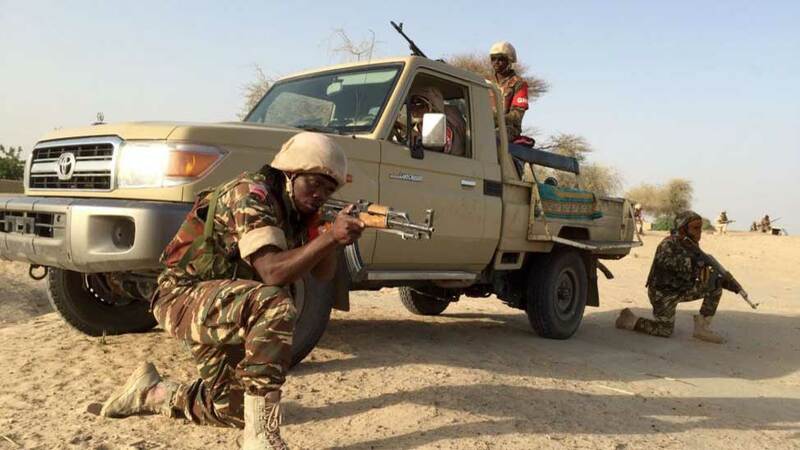 Another issue is the difficulty of redeploying the coalition soldiers in those specific areas where Boko Haram followers retreat, such as Sambisa forest, the Mandara mountains in Cameroon, and the majority of the Lake Chad Islands. Overcoming mistrust between the members of the coalition and establishing a single chain of command would help to better coordinate their military efforts, improve the responsiveness of the force and progressively restore peace and calm in the areas destabilized by Boko Haram. The second challenge for the coalition is to go beyond a purely military answer, attempt to address why there is support for Boko Haram, and to address the poverty and violence that’s often spurred by state forces. Compared to other regions in Africa, the Lake Chad Basin is less developed, lacks infrastructure, and is neglected by countries of the region. At the time Boko Haram emerged, 77.6% of north-eastern Nigerians and 74% of Cameroonians in the northern part of the country lived below the poverty line. This provided fertile ground for Boko Haram, which recruited fighters from among the jobless youth and earned local support by taking advantage of grievances based on social inequalities, injustice, and marginalization. Rather than addressing these socio-economic causes of the emergence of Boko Haram, the regional response to the crisis appears to have made matters worse as it put people at risk, jeopardized the local economy, exacerbated the humanitarian situation and increased poverty and vulnerability among these populations. More problematically, the perception of the counter-terrorism forces are regarding with increasing negativity among the population, and especially in Nigeria, for having been a source of insecurity due to the destruction of villages and properties and the devastation of the local economy in an already exceedingly poor and under developed region. These issues make it difficult for the coalition to root out Boko Haram’s sources of local support and its capacities to recruit new members. To address this problem, more efforts are needed to implement the Buhari plan for development combining a blueprint for the humanitarian relief, the socioeconomic stabilization of the North-East of Nigeria and the Cameroonian Emergency Plan for Development of the Far north region. Moreover, these plans and measures should be harmonized around all countries of the Lake Chad Basin. The third challenge is the reintegration of Boko Haram’s former fighters. The major question here is: What to do with the fighters when they leave the terrorist group or are captured? Those members who were members of Boko Haram sometimes launched violent attacks to kidnap or kill civilians and security forces in the Lake Chad region and even in their own villages. According to the International Crisis Group, it appears that when the majority of these former Boko Haram fighters desert the front or are captured, they are either detained in jails or in military camps, where they are sometimes executed, often without trials. Not only are human rights violated, but this situation also provides major disincentives for Boko Haram members to defect and demobilize. At this stage of the response to Boko Haram, the adoption and implementation of a clear strategy for the de-radicalization and the reintegration of former Boko Haram fighters is therefore long overdue. Such a strategy would help respect human rights, encourage defections, accelerate demobilization, reduce the risk of recidivism, and reduce Boko Haram’s nuisance capacity in the sub-region. The main objective currently pursued by states in the Lake Chad Basin is the search for peace, stability, and security. But their efforts are overly focused on military actions. Thus, the defeat of this terrorist group cannot happen without further initiatives that include military, socio-economic, and social reinsertion aspects. There are several barriers to their path. Firstly, it remains to be seen whether the Lake Chad Basin states have the willingness to work on their relations to enable a smooth working relationship when they have to face a common enemy. Secondly, budgetary constraints inside each state in this region could limit their capacity to mobilize finance and address socio-economic as well as development challenges in the Lake Chad area. The challenge will also be to harmonize these socioeconomic and development plans around the sub-region. The lesson here is that states in the Lake Chad Basin and beyond should work on their mutual relations and be focused on conflict prevention to defeat Boko Haram not just technically but in actual fact. Elysée Martin Atangana is a young analyst graduated of second master in international Studies at the University of Montreal. He is member of the Center for international Peace and Security Studies in Montréal. His research concerns security cooperation against new forms of threat in the Lake Chad Basin and beyond.